Early last year Iris Schreier contacted me about the possibility of designing a Hat pattern or two for a series of books she was putting together. The common theme amongst all the books was 'one + one' - to use two skeins of ArtYarns speciality yarn; either 2 of the same type but in different colours, or two of the same colour but in different types. Naturally, I was in. I always want in when there's a Hat book around! This challenge was a little bit different, so I put on my thinking cap (pun intended) to see what I could come up with. 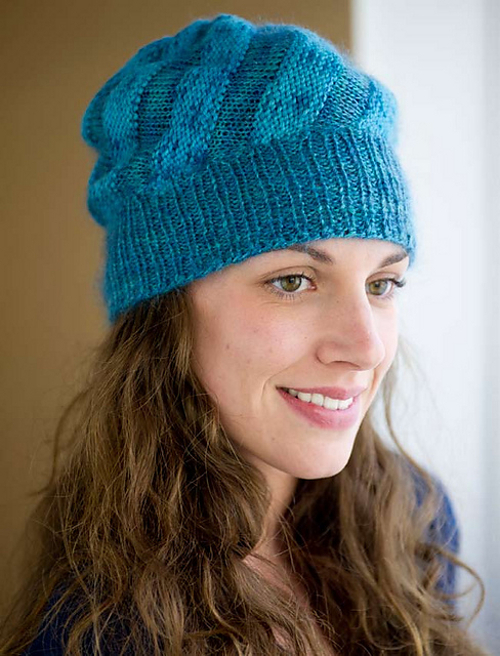 The first design, the Bias Slouchy Hat, features two very different yarns in the same colourway. Here I wanted to play with the drapey properties of each yarn, and how different the fabrics would be if knitting on the same size needles. 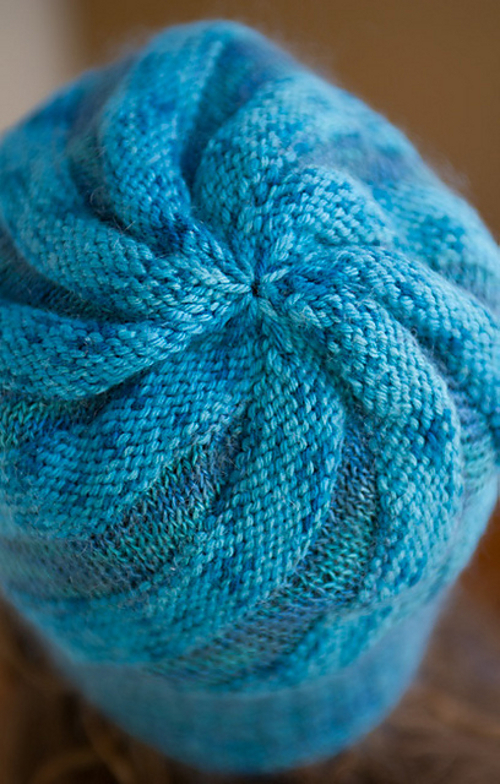 The body (+ crown) is knitted sideways, on the bias, and the brim is then picked up and worked down. 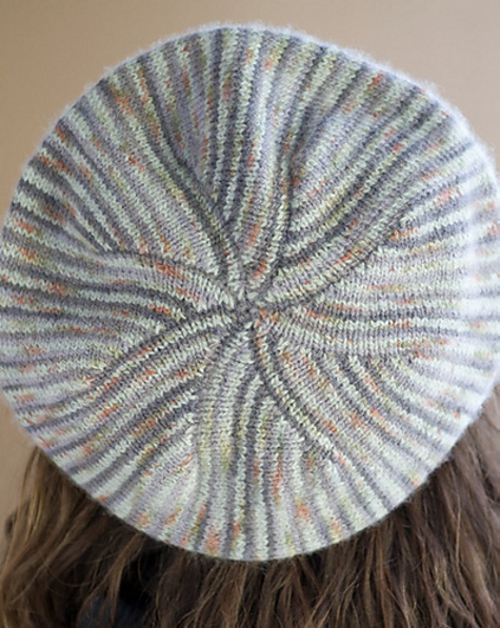 The brim actually has the finer yarn from the body doubled up, to make a a firmer fabric. The heavier yarn used is ArtYarns Supermerino, and the finer yarn is ArtYarns Rhapsody Light. Both are quite different, and I love how the same colourway plays out so differently on the different fibres. The second design was much more classic. I met Iris in person for the first time at TNNA last year, where I had the chance to browse her yarns and make a selection for the designs I wanted to do. I already had the design idea for this one pretty much mapped out, and when I saw these two colourways together, I knew I'd found my yarns. The Sideways Pinstripe Beret uses 2 skeins of ArtYarns Cashmere Sock which is delicious to knit with. Very delicious. And it's perfect for fine pinstripes like this, which show off the gradual colour changes. This beret could be knit in much starker colourways for a striking effect, should that take your fancy. one + one: Hats is available for pre-order on Amazon, with a publication date of November 2012, just in time for the winter season! I enjoyed working on these designs; clearly I was on a sideways kick again, which is always fun. There's some 30 Hats in the one book, and I'm very much looking forward to having a good look through to see all the variety - there's a great range of styles included and some clever interpretations of the one + one theme.